e-LockBox | RK Software, Inc. The growth of online payments continues to explode. According to one industry analyst, 32 million U.S. households pay bills online at their bank’s website. Your customers are benefiting from the advantages of electronic payments resulting in efficient processing and timely posting of payments contributing to a positive customer experience. Just because your customer’s initiate a payment transaction from their online banking portal, it may still arrive to you as a paper check. Paper checks cost time and money to process. The problems check payments can cause may contribute to customer attrition and growing problems. RK Software is here to help you benefit from capturing payments from your customers that remit payments from their online banking portals. We have partnered with the electronic payment networks, which provide us access to practically every online banking service provider. The elimination of checks results in more electronic payments and increased revenues to our customers. 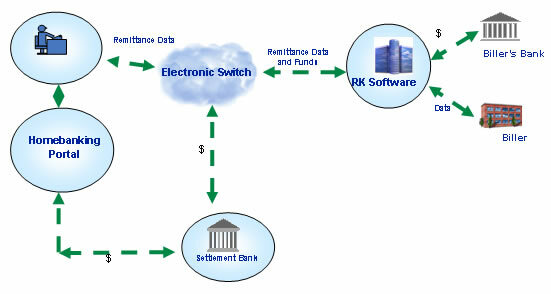 Rather than receive payments from multiple endpoints they are consolidated through RK Software Inc. resulting in a single connection point. All the payments that you receive from RK Software Inc. represent good funds. Our solution eliminates the risk of returned items due to insufficient funds. Our connection points have access to home banking providers, walk-in payment locations, credit unions and bill payment web portals. Increase payment cash flows by the reduction of check payments. Reduction of customer inquiries due checks lost in the mail or not able to be posted by your financial institution. Now is the time to take advantage of the opportunities to benefit from online bill payment. At RK Software Inc. we have deep payment domain experience. Since we understand the electronic payment landscape your organization can maximize with both our expertise and technology. Partner with us and let us help you to increase your revenues with one single connection point. The use of electronic online bill payment continues to increase due to the consumer benefits derived as compared to paper remittances. Electronic payments continue to provide convenience and timely payment posting. For billers, financial institutions and service providers, it delivers exceptional savings, enhanced productivity and valuable advantages. In 2001 approximately 12 million U.S. households paid bills via online channels. By 2004, that number increased to over 34 million households and it is forecasted the number will escalate to 50 million by the end of 2008 according to the eMarketer Spotlight Report. In spite of this, 70% of consumers rely on paper checks. Through a partnership with RK Software Inc. and our e-Lockbox Product, your customer’s will have the ability to remit payments electronically through their on line home banking application. Even when customers remit payment instructions for an on line bill payment in many situations this payment is routed to the biller as paper check. However, through a partnership with RK Software we can provide these payments to you in an electronic format. This product provides your customers with an additional electronic remittance channel. This process replaces check remittances and provides a seamless payment interface for your customers. In today’s environment customers remit payments via checks. However, online home banking applications have increased in consumer acceptance and have become a popular channel used to remit payments. Once your customer registers through their on-line banking portal they have the ability to remit payments directly from their checking or savings account or set up recurring debits. Online banking applications provide consumers to pay their bills from their bank website. RK Software has developed connectivity with the several electronic payment networks and with a single connection point has the ability to connect with the industry’s most comprehensive online banking and bill payment Origination points. This includes access to virtually every (CSP) Consumer Service Provider for electronic payments delivered in the United States. Through this connection, RK Software Inc. has access to over 99% of the online banking portals. By partnering with RK Software Inc. you will receive payments from new electronic endpoints. These new endpoints include, Application Service Providers, (ASPs), Kiosks Pay Services, Banks, Walk In Bill Payment Providers, and other electronic payment organizations. This connectivity enables consumers to remit payments from their on-line banking institution to RK Software Inc. and based on instructions and business rules, RK Software Inc. will route the payments and remittance data to your bank or designated location. RK Software Inc. offers a robust reporting capability that delivers summary and detail reports. These reports deliver key business intelligence that can help you to monitor performance and identify new opportunities. RK Software will remit biller data directly to you where you designate. In addition, all funds will be settled with your financial institution’s bank via ACH. Customer remittance data will be transmitted to the designated account set-up during implementation. During the implementation phase we will work with you and your financial institution to ensure the account masks and remittance data is accurately stated. In addition, all bank routing information will be verified to ensure payments will be routed to the designated account. All changes to customer accounts must be communicated to RK Software, Inc. in order for the account mask information updated to the payment Originators. As a single payment connection point, RK Software Inc. will provide well trained support to assist you and your customers to resolve issues on a timely basis. In addition, support tools will be available to help in resolving payment issues on a timely basis. Although this new product will provide increased operating efficiencies, this value must be communicated to your customers. In order to accomplish this, we provide a marketing program to assist you to educate your customers. The customer awareness campaigns are designed to expand online banking bill payment awareness for your customers to remit payments through their online payment channel. We look forward to hearing from you and partnering together to provide value and flexibility and a better experience to your customers.